On Sunday, I attended the room: PIPES featuring Polly Moller, Pamela Z and Jane Rigler. The Room chambre series, hosted an produced by Pamela Z, take place in the Royce Gallery, an “intimate performance gallery” in the Mission District of San Francisco. 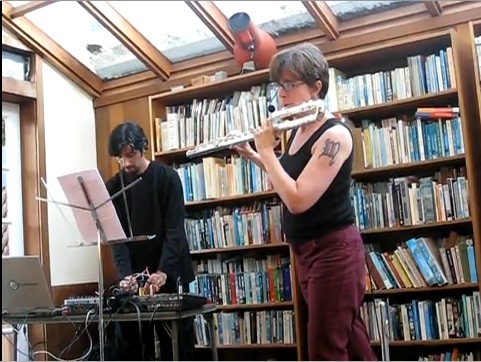 The room: PIPES performance featured performances that incorporated flutes. Before the start of the performance, we were treated to a welcome by “Ellie”, the freight elevator in the building that houses the Royce Gallery. While some music purists might be appalled to have a freight elevator included in a performance, I found it quite charming to incorporate an element of the industrial setting. 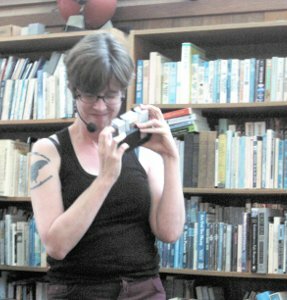 Polly Moller presented a new work, Three of Swords. 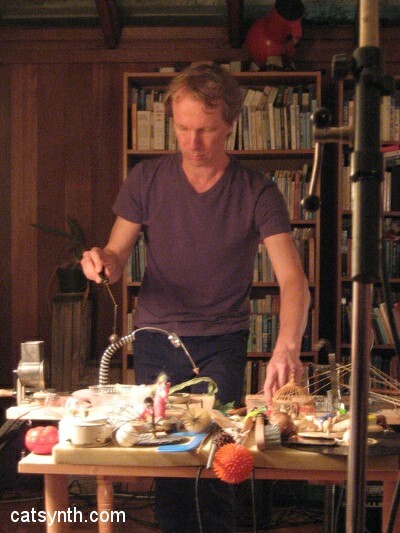 The performance included an arrangement of Tarot cards, a timer and a series of candles to mark sections of the piece. In each selection, a card was drawn, and the music was an improvisation based on that card. The music focused on extended flute techniques; for example, the first draw led to an improvisation with the head of a bass flute using microtones, overblowing, whistles, clicks and other inspiring sounds. The one section of the performance that stood apart from the others was the drawing of the Three of Swords, illustrated to the right, which launched a very detailed but very expressive description of the human heart. Pamela Z‘s playful and energetic performance did not feature flutes, but instead focus on voice. 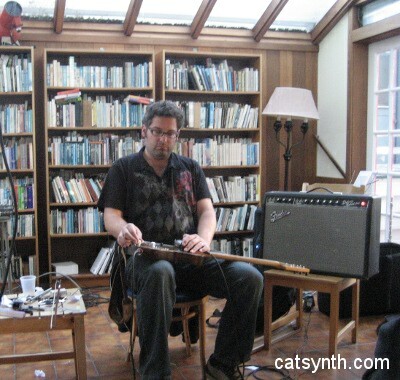 It began with live looping of tonal and harmonic singing (look up “live looping” here on CatSynth for a primer if you’re not familiar with the technique), and gradually moved to more extended vocal techniques, including clicks, screeches (with electronic processing), whispers, etc. The video in the background displayed an interior of an old industrial or loft space, empty except for a trunk that appeared and disappeared at various times. Sometimes it was open, to reveal drawers and messy clothes. Jane Rigler opened her set with a virtuosic flute and electronics piece and the welcoming statement “Do not fear the microphone and piccolo.” She then performed her piece A la pintura, inspired by Robert Motherwell’s paintings, which were in turn a response to Spanish poet Rafael Alberti’s poems celebrating painting. Motherwell’s paintings, both as stills and as animations, were projected during the performance, and there were also moments where text was projected, presumably excerpts from Alberti’s poems. Motherwell’s paintings are quite abstract, focusing on textual elements and geometry. To have these images along with strong flute-and-electronics music (a favorite instrumental combination of mine) was a treat. OK, so I have been delinquent in reviewing some of own recent shows. I was hoping to find photos, but so far I have not found any. It does happen once in a while even in this hyper-photographic society. In fairness, I have taken photos at many shows I attend, but then find out they were not good enough to post. So, we will just go ahead and use our visual imagination. 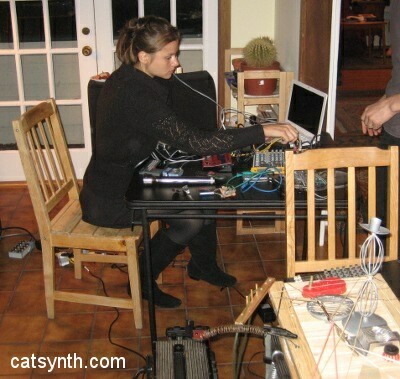 The Pmocatat Ensemble records the sounds of their instruments onto various forms of consumer-ready media. (Pmocatat stands for “prerecorded music on cds and tapes and things”.) Then, they improvise using only the recorded media. 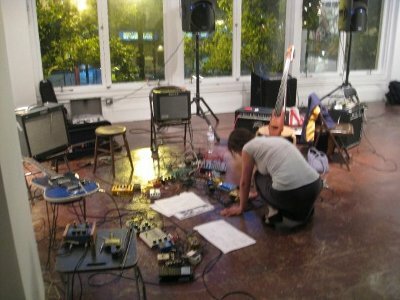 Several different pieces will explore both the different arrangements of recorded instruments and the sound modulation possibilities of the different recording media. In my case, my pre-recorded media was digital audio played on an iPhone. I used recordings of my Indian and Chinese folk instruments, and I “played” by using the start, stop, forward, rewind, and scrubbing operations. Other members included Matt Davignon, James Goode, John Hanes, Suki O’Kane, Sarah Stiles, Rent Romus, C. P. Wilsea and Michael Zelner. 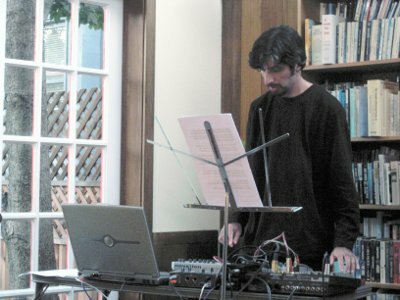 Matt Davignon, who organized the ensemble, had composed some pieces which provided much needed structure and avoid a “mush” of pre-recorded sound. Some portions were solos or duos, with various other members of the ensemble coming in and out according to cues. This allowed for quite a variety of texture and musicianship. I definitely hope the Pmocatat Ensemble continues to the perform. 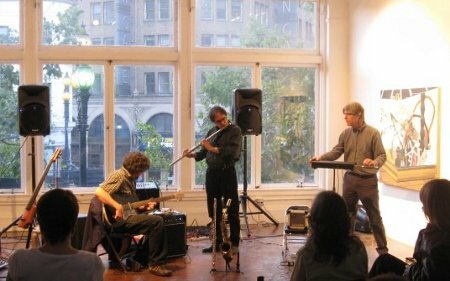 The following Monday, March 16, I curated a set at the Ivy Room Experimental/Improv Hootenany with Polly Moller and Michael Zbyszynski. I know Polly and Michael from completely different contexts, so it was interesting to hear how that would work together. 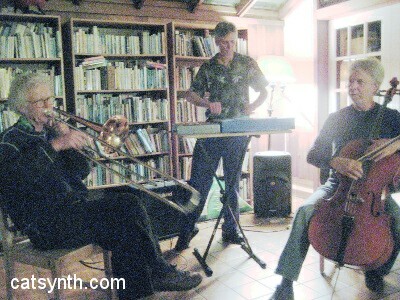 Michael played baritone sax and Polly performed new words as well as flute and finger cymbals. I played my newly acquired Chinese instruments, the looping Open Sound World patch I often use, and a Korg Kaos Pad. Musically, it was one of those sets that just worked. I was able to sample and loop Polly’s extended flute techniques into binary and syncopated rhythms, over which the trio could improvise. Periodically, I changed the loops, sometimes purposely to something arhythmic to provide breathing space. Michael’s baritone sax filled out the lower register against the flute and percussion. appeared to me to be the big red shiny candy button of the outer space ren. brittle energy and a persistent comet trail of danger. The “big red shiny candy button of the outer space ren” was undoubtedly the Korg mini-Kaos Pad. Amar’s curation seemed like a well orchestrated composition; Polly’s contribution on voice and flutes adding much to that. Not bad for a birthday show :).